黄明, 王朝辉, 罗来超, 王森, 曹寒冰, 何刚, 刁超朋. 垄覆沟播及施肥位置优化对旱地小麦氮磷钾吸收利用的影响[J]. 植物营养与肥料学报, 2018, 24(5): 1158-1168. HUANG Ming, WANG Zhao-hui, LUO Lai-chao, WANG Sen, CAO Han-bing, HE Gang, DIAO Chao-peng. Effects of ridge mulching, furrow seeding, and optimized fertilizer placement on NPK uptake and utilization in dryland wheat[J]. Journal of Plant Nutrition and Fertilizers, 2018, 24(5): 1158-1168. Abstract: 【Objectives】 Water-conserved cultivation and fertilizer management have been the research focus in dryland cropping systems of China. Most attention has concentrated on yield formation and water utilization, less research on crop nutrient uptake and utilization. We investigated the effects of ridge mulching, furrow seeding, and optimized fertilizer placement on uptake and utilization of nitrogen (N), phosphorus (P) and potassium (K) and in order to provide a theoretical basis for high-yield and profitable production of wheat in drylands. 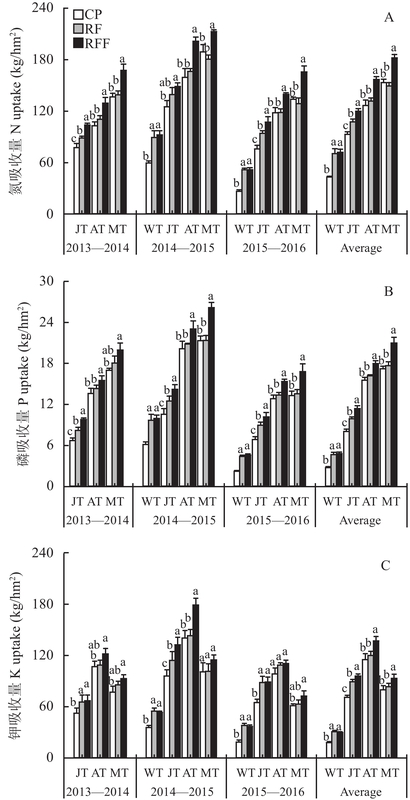 【Methods】 A continuous experiment in the fixed plots was conducted in the typical dryland of central Loess Plateau in the climatically normal year of 2013–2014, wet year of 2014–2015 and dry year of 2015–2016. Winter wheat was sown in three patterns: conventional flat pattern without plastic film mulching but with uniform fertilization (CP), ridge mulching, furrow seeding with uniform fertilization (RF), and ridge mulching, furrow seeding with side-dressed fertilization under plastic film (RFF). Yield, economic return, and nutrient uptakes and distributions, nutrient harvest indexes, nutrient uptake efficiencies, fertilizer partial factor productivities for N, P and K, and physiological efficiencies and requirements of N, P and K for grain yields were analyzed. 【Results】 Compared with CP, the yield under RF was increased by 9.5% and 6.3%, respectively, but the economic return and the rate of output to input under RF had no significant changes. In the normal year and dry year, RFF significantly increased the economic return and ratio of output to input by 23.4% and 9.1% compared with CP, and 21.5% and 14.6% compared to RF, averaged across the three years. 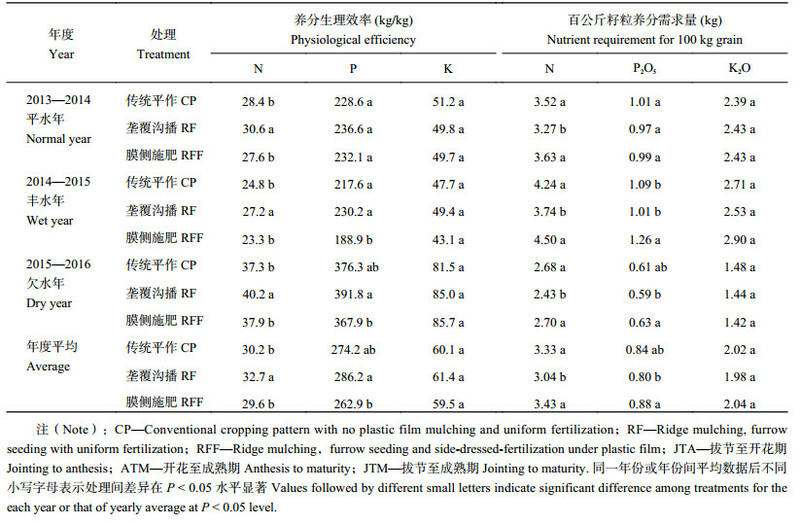 Compared with CP, RF had no significant effects on NPK uptake efficiencies due to the decreased NPK uptakes after jointing stage of winter wheat, but it increased the N physiological efficiency and NPK fertilizer partial factor productivities by 7.7%, 7.1%, 8.1% and 6.7%, respectively, and decreased the N requirement for 100 kg grain by 8.7%. Although RFF did not affect the NPK harvest indexes, NPK physiological efficiencies and NPK requirements for 100 kg grain, it increased the average NPK uptake efficiencies by 18.4%, 22.1% and 16.4% and NPK fertilizer partial factor productivities by 16.0%, 16.8% and 15.6%, respectively compared with CP. 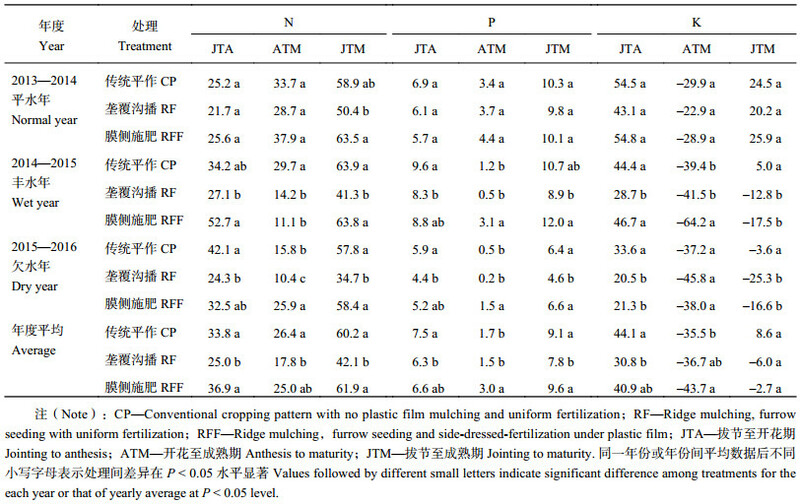 Compared with RF, RFF increased the NPK uptakes at anthesis and maturity and NPK distributions in straw and grain at maturity, and thus significantly increased NPK uptake efficiencies by 20.8%, 18.0% and 12.1%, NPK fertilizer partial factor productivities by 8.3%, 8.1% and 8.4%, NP requirements for 100 kg grain by 28.3% and 10.0%, but decreased NP harvest indexes by 3.9% and 4.2%, NP physiological efficiencies by 9.5% and 8.1%, respectively, averaged across the three years. 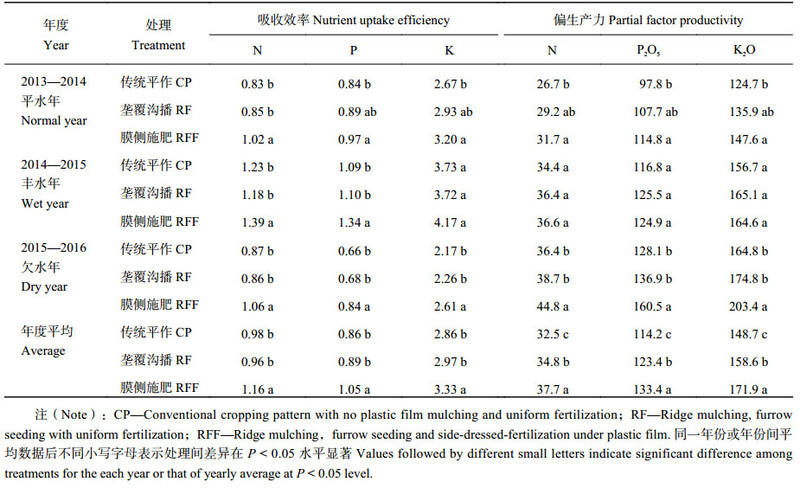 【Conclusions】 Ridge mulching, furrow seeding with uniform fertilization could decrease the N requirement and increase the N physiological efficiency and NPK fertilizer partial factor productivities, but not increase the overall economic return. Ridge mulching, furrow seeding with side-dressed fertilization under plastic film is beneficial for NPK uptakes at different growth stages, and thus increases economical return, nutrient uptake efficiencies and fertilizer partial factor productivities for N, P and K, but special attention should be paid to the decreased NP physiological efficiencies and the increased NP requirements under this practice. 注（Note）：CP—No plastic film mulching and uniform fertilization；RF—Ridge mulching，furrow seeding and uniform fertilization；RFF—Ridge mulching, furrow seeding and side-dressed fertilization. 同一年份或年份间平均数据后不同小写字母表示处理间差异在 P < 0.05 水平显著 Values followed by different small letters indicate significant difference among treatments for the same year or for the yearly average at P < 0.05 level. 注（Note）：CP—Conventional cropping pattern with no plastic film mulching and uniform fertilization；RF—Ridge mulching, furrow seeding with uniform fertilization；RFF—Ridge mulching，furrow seeding and side-dressed-fertilization under plastic film；JTA—拔节至开花期 Jointing to anthesis；ATM—开花至成熟期 Anthesis to maturity；JTM—拔节至成熟期 Jointing to maturity. 同一年份或年份间平均数据后不同小写字母表示处理间差异在 P < 0.05 水平显著 Values followed by different small letters indicate significant difference among treatments for the each year or that of yearly average at P < 0.05 level. 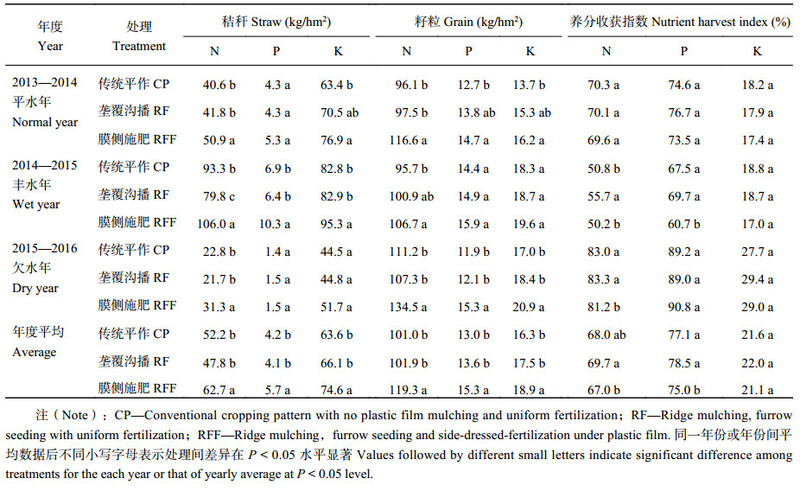 注（Note）：CP—Conventional cropping pattern with no plastic film mulching and uniform fertilization；RF—Ridge mulching, furrow seeding with uniform fertilization；RFF—Ridge mulching，furrow seeding and side-dressed-fertilization under plastic film. 同一年份或年份间平均数据后不同小写字母表示处理间差异在 P < 0.05 水平显著 Values followed by different small letters indicate significant difference among treatments for the each year or that of yearly average at P < 0.05 level. 黄明, 王朝辉, 罗来超, 等. 膜侧施肥对旱地小麦产量、籽粒蛋白质含量和水分利用效率的影响[J]. 作物学报, 2017, 43(6): 899–911. Huang M, Wang Z H, Luo L C, et al. Effects of ridge mulching with side-dressing on grain yield, protein content and water use efficiency in dryland wheat[J]. Acta Agronomica Sinica, 2017, 43(6): 899–911. 陈磊, 郝明德, 张少民, 等. 黄土高原旱地长期施肥对小麦养分吸收和土壤肥力的影响[J]. 植物营养与肥料学报, 2007, 13(2): 230–235. 刘金山, 戴健, 刘洋, 等. 过量施氮对旱地土壤碳、氮及供氮能力的影响[J]. 植物营养与肥料学报, 2015, 21(1): 112–120. Liu J S, Dai J, Liu Y, et al. Effects of excessive nitrogen fertilization on soil organic carbon and nitrogen and nitrogen supply capacity in dryland[J]. Journal of Plant Nutrition and Fertilizer, 2015, 21(1): 112–120. 张礼军, 鲁清林, 白玉龙, 等. 施肥和覆盖模式对旱地冬小麦花后干物质转移、糖代谢及其籽粒产量的影响[J]. 草业学报, 2017, 26(3): 149–160. Zhang L J, Lu Q L, Bai Y L, et al. Effects of different patterns of fertilization and mulching on the post-anthesis dry matter remobilization, sugar metabolism and grain yield of winter wheat in drylands[J]. Acta Pratacultreae Sinica, 2017, 26(3): 149–160. 汤永禄, 李朝苏, 吴春, 等. 播种方式对丘陵旱地套作小麦立苗质量、产量及效益的影响[J]. 中国农业科学, 2013, 46(24): 5089–5097. 柴守玺, 杨长刚, 张淑芳, 等. 不同覆膜方式对旱地冬小麦土壤水分和产量的影响[J]. 作物学报, 2015, 41(5): 787–796. Chai S X, Yang C G, Zhang S F, et al. Effects of plastic mulching modes on soil moisture and grain yield in dryland winter wheat[J]. Acta Agronomica Sinica, 2015, 41(5): 787–796. 李廷亮, 谢英荷, 任苗苗, 等. 施肥和覆膜垄沟种植对旱地小麦产量及水氮利用的影响[J]. 生态学报, 2011, 31(12): 212–220. Li T L, Xie Y H, Ren M M, et al. Effects of fertilization and plastic film mulched ridge-furrow cultivation on yield and water and nitrogen utilization of winter wheat on dryland[J]. Acta Ecologica Sinica, 2011, 31(12): 212–220. 屈会峰, 赵护兵, 刘吉飞, 等. 不同覆盖措施下旱地冬小麦的氮磷钾需求及其生理效率[J]. 植物营养与肥料学报, 2017, 23(4): 874–882. Qu H F, Zhao H B, Liu J F, et al. NPK requirements and their physiological efficiencies for winter wheat under different cover measures in dryland[J]. Journal of Plant Nutrition and Fertilizer, 2017, 23(4): 874–882. 任爱霞, 孙敏, 高志强, 等. 夏闲期覆盖配施氮肥对旱地小麦土壤水分及氮素利用的影响[J]. 中国农业科学, 2017, 50(15): 2888–2903. Ren A X, Sun M, Gao Z Q, et al. Effects of mulching during the fallow period and nitrogen fertilizer on soil water and plant nitrogen use of dry-land wheat[J]. Scientia Agricultura Sinica, 2017, 50(15): 2888–2903. 张正茂, 王虎全. 渭北垄覆沟播小麦最佳种植模式及微生境效应研究[J]. 干旱地区农业研究, 2009, 21(3): 55–60. 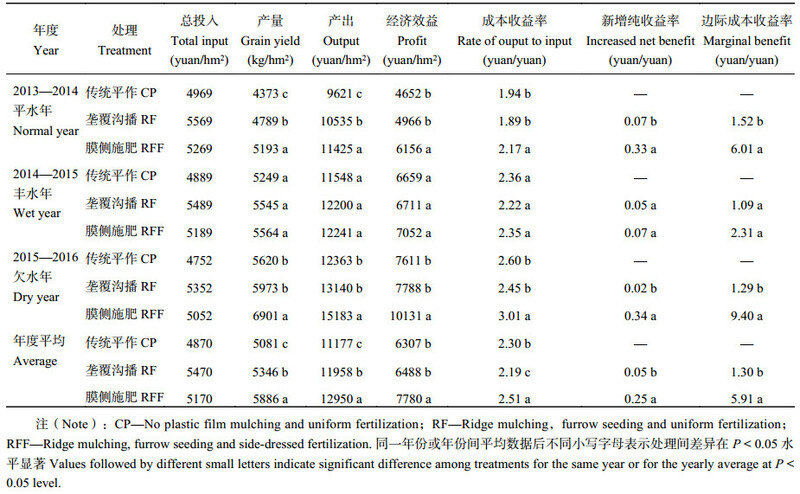 Zhang Z M, Wang F Q. Optimal planting pattern of film mulching wheat and its micro-environmental effects on Weibei dry-land[J]. Agricultural Research in the Arid Areas, 2009, 21(3): 55–60. 王火焰, 周健民. 根区施肥—提高肥料养分利用率和减少面源污染的关键和必需措施[J]. 土壤, 2013, 45(5): 785–790. Wang H Y, Zhou J M. Root-zone fertilizer placement: A key and necessary approach to improve fertilizer use efficiency and reduce non-point source pollution from the cropland[J]. Soils, 2013, 45(5): 785–790. 白由路. 国内外施肥机械的发展概况及需求分析[J]. 中国土壤与肥料, 2016, (3): 1–4. Bai Y L. Analysis of the development and the demands of fertilization machinery[J]. Soil and Fertilizer Sciences in China, 2016, (3): 1–4. Duan W , Shi Y, Zhao J, et al. Depth of nitrogen fertilizer placement affects nitrogen accumulation, translocation and nitrate-nitrogen content in soil of rainfed wheat[J]. International Journal of Plant Production, 2015, 9: 237–256. 王应君, 王淑珍, 郑义. 肥料深施对小麦生育性状、养分吸收及产量的影响[J]. 中国农学通报, 2006, 22(9): 276–280. 江尚焘, 王火焰, 周健民, 等. 磷肥施用方式及类型对冬小麦产量和磷素吸收的影响[J]. 应用生态学报, 2016, 27(3): 1503–1510. Jiang S T, Wang H Y, Zhou J M, et al. Effects of phosphorus fertilizer application methods and types on the yield and phosphorus uptake of winter wheat[J]. Chinese Journal of Applied Ecology, 2016, 27(3): 1503–1510. 方日尧, 赵惠青, 同延安. 渭北旱原冬小麦深施肥沟播综合效应研究[J]. 农业工程学报, 2000, 16(1): 49–52. Fang R Y, Zhao H Q, Tong Y A. Research on integrated effect of deep application of fertilizer and furrow-sowing winter wheat on Weibei rainfed highland[J]. Transactions of the Chinese Society of Agricultural Engineering, 2000, 16(1): 49–52. 康利允, 沈玉芳, 岳善超, 等. 不同水分条件下分层施磷对冬小麦根系分布及产量的影响[J]. 农业工程学报, 2014, 30(15): 140–147. 张北赢, 徐学选, 刘文兆, 等. 黄土丘陵沟壑区不同降水年型下土壤水分动态[J]. 应用生态学报, 2008, 19(6): 1234–1240. Zhang B Y, Xu X X, Liu W Z, et al. Dynamic changes of soil moisture in loess hilly and gully region under effects of different yearly precipitation patterns[J]. Chinese Journal of Applied Ecology, 2008, 19(6): 1234–1240. 何刚, 王朝辉, 李富翠, 等. 地表覆盖对旱地小麦氮磷钾需求及生理效率的影响[J]. 中国农业科学, 2016, 49(9): 1657–1671. He G, Wang Z H, Li F C, et al. Nitrogen, phosphorus and potassium requirement and their physiological efficiency for winter wheat affected by soil surface managements in dryland[J]. Scientia Agricultura Sinica, 2016, 49(9): 1657–1671. 张萌, 孙敏, 高志强, 等. 旱地麦田休闲期覆盖保水与植株氮运转及产量的关系[J]. 应用生态学报, 2016, 27(1): 117–124. Zhang M, Sun M, Gao Z Q, et al. Relationships of water conservation through mulching in fallow period with wheat nitrogen transportation and crop yield in dryland[J]. Chinese Journal of Applied Ecology, 2016, 27(1): 117–124. 刘永哲, 陈长青, 尚健, 等. 沙壤土包膜尿素释放期与小麦适宜施用方式研究[J]. 植物营养与肥料学报, 2016, 22(4): 905–912. Liu Y Z, Chen C Q, Shang J, et al. Release durations and suitable application patterns of coated urea on winter wheat in sandy loam soil[J]. Journal of Plant Nutrition and Fertilizer, 2016, 22(4): 905–912. 艾应伟, 陈实, 张先婉, 等. 垄作不同土层施肥对小麦生长及氮肥肥效的影响[J]. 植物营养与肥料学报, 1997, 3(3): 255–261. 罗锡文, 廖娟, 胡炼, 等. 提高农业机械化水平促进农业可持续发展[J]. 农业工程学报, 2016, 32(1): 1–11. Luo X W, Liao J, Hu L, et al. Improving agricultural mechanization level to promote agricultural sustainable development[J]. Transactions of the Chinese Society of Agricultural Engineering, 2016, 32(1): 1–11.